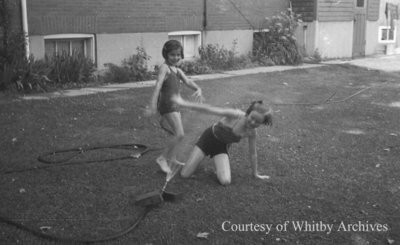 A black and white negative of Marian and Jane playing outside with a hose. In this view one child is crouching and facing the hose nozzle and the other child is running away from the water. Marian & Jane Playing, June 12, 1938, Marjorie Ruddy. Whitby Archives A2013_040_770B.